What to make on a busy weeknight? 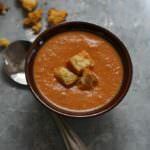 Tomato Bisque Soup is easy & soo flavorful! Yummy too with just a hint of spice. Leftovers freeze great! Begin by chopping the vegetables and mincing the garlic. Heat a large stock pot over medium heat. Add the butter & olive oil. When hot & bubbly add the onions, peppers, carrots and celery and saute for a couple of minutes. Add the dried herbs, smoked paprika, salt & pepper and continue sauteing for about 10 minutes. Add the garlic and tomato paste, stir thoroughly to combine. Add the flour and incorporate well. Cooking for about two minutes to cook out the flour taste. Add the tomatoes, chicken stock and water. Increase the heat to high and stir well until it comes to a boil. The mixture will begin to thicken. Reduce heat to medium low and simmer uncovered for about 20 minutes. After 20 minutes crumble in the goat cheese and stir until it melts thru.